What to make of change on an overheating planet. The history we grow up with shapes our sense of reality—it’s hard to shake. If you were young during the fight against Nazism, war seems a different, more virtuous animal than if you came of age during Vietnam. I was born in 1960, and so the first great political character of my life was Martin Luther King Jr. I had a shadowy, child’s sense of him when he was still alive, and then a mythic one as his legend grew; after all, he had a national holiday. As a result, I think, I imagined that he set the template for how great movements worked. They had a leader, capital L.
As time went on, I learned enough about the civil rights movement to know it was much more than Dr. King. There were other great figures, from Ella Baker and Medgar Evers to Bob Moses, Fannie Lou Hamer and Malcolm X, and there were tens of thousands more whom history doesn’t remember but who deserve great credit. And yet one’s early sense is hard to dislodge: the civil rights movement had his face on it; Gandhi carried the fight against empire; Susan B. Anthony, the battle for suffrage. That doesn’t mean, however, that the movement is diminished. In fact, it’s never been stronger. In the last few years, it has blocked the construction of dozens of coal-fired power plants, fought the oil industry to a draw on the Keystone pipeline, convinced a wide swath of American institutions to divest themselves of their fossil fuel stocks and challenged practices like mountaintop-removal coal mining and fracking for natural gas. It may not be winning the way gay marriage has won, but the movement itself continues to grow quickly, and it’s starting to claim some victories. When we started 350.org five years ago, we dimly recognized this new planetary architecture. Instead of trying to draw everyone to a central place—the Mall in Washington, D.C.—for a protest, we staged twenty-four hours of rallies around the planet: 5,200 demonstrations in 181 countries, what CNN called “the most widespread of day of political action in the planet’s history.” And we’ve gone on to do more of the same—about 20,000 demonstrations in every country but North Korea. The big environmental groups played key roles, supplying lots of data and information, while keeping track of straying members of Congress. Among them were the National Resources Defense Council, Friends of the Earth, the League of Conservation Voters and the National Wildlife Federation, none spending time looking for credit, all pitching in. 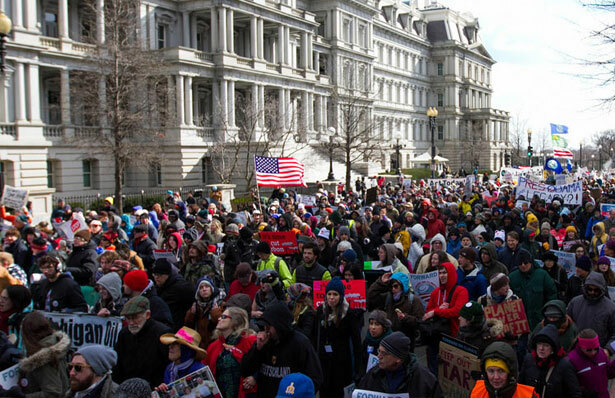 The Sierra Club played a crucial role in pulling together the biggest climate rally yet, last February’s convergence on the Mall in Washington. Non-experts quickly educated themselves on the subject, becoming specialists in the corruption of the State Department process that was to okay the building of that pipeline or in the chemical composition of the bitumen that would flow through it. CREDO (half an activist organization, half a cell phone company), as well as Rainforest Action Network and The Other 98 percent, signed up 75,000 people pledged to civil disobedience if the pipeline were to get presidential approval. That’s why it’s such good news when people like Naomi Klein and Desmond Tutu join the climate struggle. When they take part, it becomes ever clearer that what’s underway is not, in the end, an environmental battle at all, but an all-encompassing fight over power, hunger and the future of humanity on this planet. Sometimes it comes from dogged work on solutions: Wahleah Johns and Billy Parish figured out how to build solar farms on Navajo land and crowdfund solar panels on community centers. Sometimes truly unlikely figures emerge: investor Jeremy Grantham, or Tom Steyer, a Forbes 400 billionaire who quit his job running a giant hedge fund, sold his fossil fuel stocks and put his money and connections effectively to work fighting Keystone and bedeviling climate-denying politicians (even Democrats!). We have organizational leaders like Mike Brune of the Sierra Club or Frances Beinecke of NRDC, or folks like Kenny Bruno or Tzeporah Berman who have helped knit together large coalitions; religious leaders like Jim Antal, who led the drive to convince the United Church of Christ to divest from fossil fuels; regional leaders like Mike Tidwell in the Chesapeake or Cherri Foytlin in the Gulf or K.C. Golden in Puget Sound. These elders-of-all-ages also play a sorting-out role in backing the ideas of others or downplaying those that seem less useful. There are days when I feel like the most useful work I’ve done is to spread a few good Kickstarter proposals via Twitter or write a blurb for a fine new book. Conversely, I was speaking in Washington recently to a group of grandparents who had just finished a seven-day climate march from Camp David. A young man demanded to know why I wasn’t backing sabotage of oil company equipment, which he insisted was the only way the industry could be damaged by our movement. I explained that I believed in nonviolent action, that we were doing genuine financial damage to the pipeline companies by slowing their construction schedules and inflating their carrying costs and that in my estimation wrecking bulldozers would play into their hands. The thousands of images that accumulated in the Flickr account of that day’s events were astonishing. Most of the people doing the work didn’t look like environmentalists were supposed to. They were largely poor, black, brown, Asian and young, because that’s what the world mostly is. The ultimate in leaderlessness was, of course, the Occupy movement that swept the United States (and other areas of the world) in 2011-2012. It, in turn, took cues from the Arab Spring, which absorbed some of its tricks from the Serbian organizers at Otpor, who exported many of the features of their campaign against Slobodan Milosevic in the 1990s around the planet. And so our movement—global, national and most of all local. Released from a paddy wagon after the Richmond protest, standing in a long line of handcuffees waiting to be booked, I saw lots of elders, doubtless focused on different parts of the Chevron equation. Among them were Gopal Dayaneni, of the Movement Generation Justice and Ecology Project, who dreams of frontline communities leading in the construction of a just new world, and Bay Area native activist Pennie Opal Plant, who has spent her whole life in Richmond and dreams, I suspect, of kids who can breathe more easily in far less polluted air. I continue to hope for local, national and global action, and for things like a carbon tax-and-dividend scheme that would play a role in making just transitions easier. Such differing, overlapping dreams are anything but at odds. They all make up part of the same larger story, complementary and complimentary to it. These are people I trust and follow; we have visions that point in the same general direction; and we have exactly the same enemies who have no vision at all, save profiting from the suffering of the planet. What was missing from Chris Hayes’s climate change documentary, The Politics of Power?